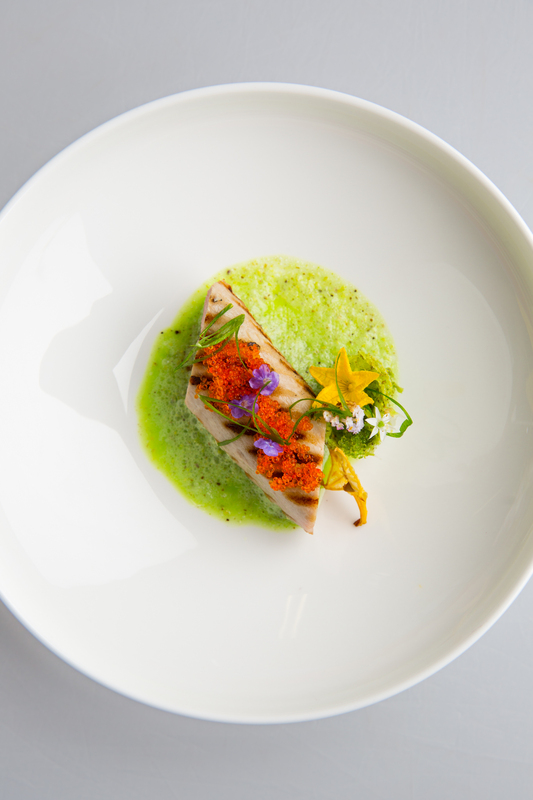 Try one of the North Island Kitchen’s latest recipes at home: seared Yellowfin Tuna with coconut, palm heart and wild spinach soup, garnished with papaya pearls and edible flowers. Melt the butter in a skillet over medium-high heat and sauté the onion and garlic until translucent for about 2 minutes. Add the palm heart and sauté for an extra minute before adding the fresh coconut milk. Bring the soup to a simmer and cook for about 20 minutes until the palm heart is soft and tender. In the meantime, blanch your spinach for 1 minute and refresh in iced water to keep the colour bright green. Add the spinach to the soup and blend. Strain using a chinois for a finer texture. Season well with salt and pepper to taste. A hint of truffle oil can be added if needed. Place the vegetable oil in a small deep jug in the freezer and allow to chill for at least 30 minutes. Combine the papaya purée and fish consommé in a pot and bring to a boil, then add the agar agar. Pour the mix into a bowl and fill a pipette with the mixture. Remove the oil from the freezer and drip the mixture into the oil slowly. Using a sieve, remove the papaya pearls and rinse them in cold water. Place them in the fridge until plating. Sear the Yellowfin Tuna to the desired temperature and let it rest. Pour the soup onto the bottom of the shallow bowl and plate the seared tuna on top. Garnish with papaya pearls and finish it off with edible flowers.